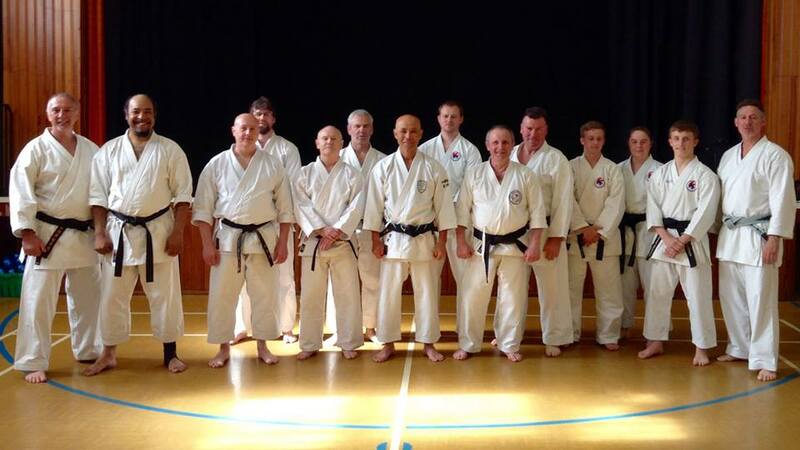 Saturday 4th July 2015 saw the return of Sensei Keith Walker to the club for another excellent Wado Masters course. Thank you to Sensei for once again coming to Hartlepool, and to those from other clubs who made the journey to support the event. Thank you also to our students who came along to train too. The course started with full body exercises to get us moving, with a particular emphasis on keeping the hips low and went on to cover the centre line in detail, especially whilst practising basics. This was broken down by taking junzuki-dachi to a neutral position at the half way point, before finishing. 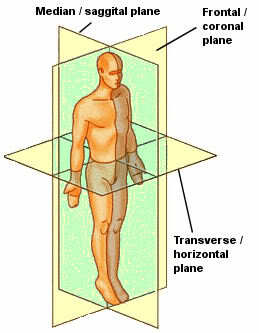 The centre being key to the entire movement, and not allowing the punch to drag the body into place, but rather have the hips be the driving force. Body torque was also covered extensively, in particular with gyakuzuki (reverse punch), and neko-ashi-dachi (cat stance), again with an emphasis on the centre line and relaxation. All the basics were really an exercise in internal relaxation and movement, fundamental to Wado and the difference between being able to deliver maximum force into an opponent with minimal effort and, well, hurting yourself. The basics naturally progressed to Kata where it was actually quite difficult to put our learnings from single movements into a complete Kata – much more practise required. I think a lot of Karate training, in particular the sport side focuses too much on the ‘external’ i.e. what a technique looks like, what silhouette your body makes etc… we tend to train hard on making these shapes and build up strong muscles but are we actually causing more harm? is our typical training overemphasising muscle development over relaxation? causing muscle imbalances and alignment problems? 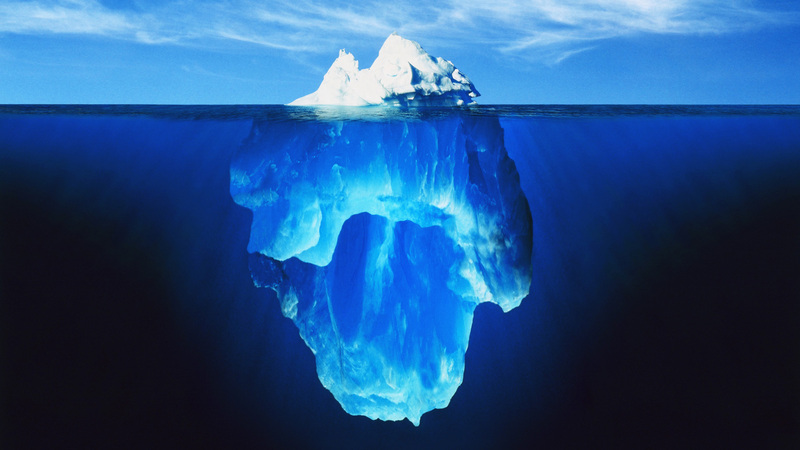 There’s a really interesting graphic on the Internal Power Facebook page which summarises this point perfectly. Wado should really be about using the centre and being relaxed. Learning how to teach these two elements better to our students is vital, else Wado Karate will simply become another ‘sport’. This exercise (which I’ve stolen and dubbed ‘Box Kata’) was all about focusing on the movement of the body rather than the shape of the technique. As Sensei explained, when performing a Kata, we are often focussed on the end result, the shape of the technique rather than how the body actually gets from A-B. 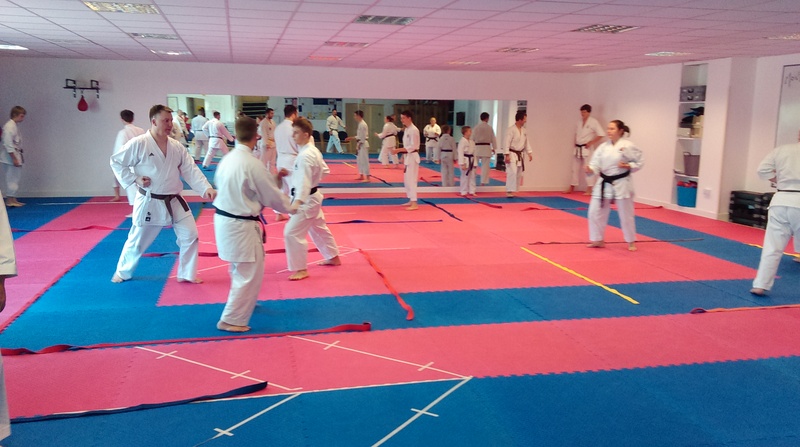 We performed a Kata inside a small 3x3m box marked on the floor with belts, the Kata movements could be performed in any direction, rather than sticking to the Kata structure. To keep things interesting, there were 3 students inside the box, all practising at the same time. Unfortunately we weren’t supposed to step on the belts, or strike through our team if they got in the way. It was an interesting lesson in Zanshin (awareness) as well as taking note of the way the body moves. We progressed to more difficult Kata, and, with an even smaller box marked out, solo Kushanku (quite a long Kata, with multiple dynamic changes of body position and direction). Sensei gave a Masterclass in Kihon Kumite which I’m not even going to try to explain in detail. He basically showed how the exercises work on the simple premise of working your opponent on the inside or outside with either a gedan, chudan or jodan strike, whilst using the mechanics of the body maximally rather than making pretty shapes, no bells and whistles, but effective. Another excellent course, and once again I personally learned tons. We will hopefully be able to get Sensei Keith Walker up to the club again over the next few months, we’ve got a crammed calendar but we’ll see what we can do. 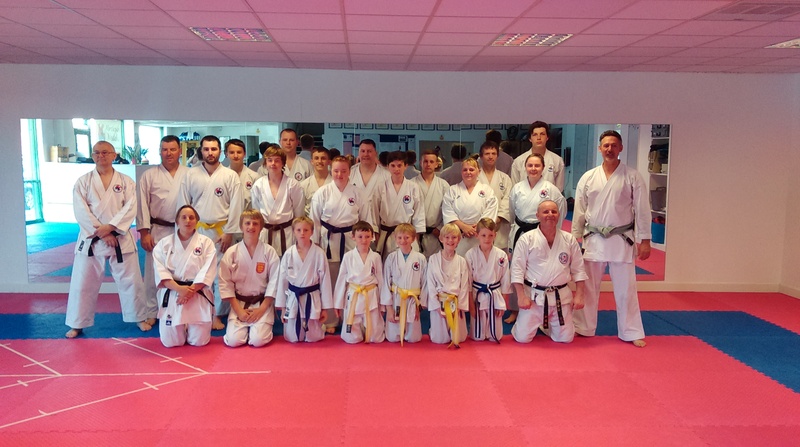 Over the weekend several members (Beth, Roy, Lewis, Carl) of Hartlepool Wadokai were able to train with Sugasawa Sensei, one of the original students of the late Wado Ryu founder Ohtsuka Sensei. The course was planned to only include a small number of students to ensure maximum opportunities for feedback from Sensei. I would like to particularly thank Mark Gallagher for arranging and hosting the course, and of course for the invite, it’s always nice to have (relatively) local events, especially with the Wado greats. Sugasawa Sensei explains Wado principles in detail and links even the most basic of warm up exercises to the art. It’s also interesting to see the differences and similarities of Wado-Kai and Wado-Ryu, despite having the same origin. I always come away from training with him feeling humbled, but massively enthusiastic at how much there is still to learn and how we often just scratch the surface of Wado in our general training. As always when training with Sugasawa Sensei, I had a few ‘lightbulb’ moments when elements of my own private training and study linked perfectly with what was discussed or demonstrated. It was a shame that we couldn’t stay over for the full weekend course but our club has such a busy calendar that there are always clashes. It was good to have chance to grab a coffee and have a chat before we headed back to the far North. I think the Hartlepool Youth (Beth, Roy, Lewis) were dazed and confused about some of the Wado history discussion taking place, but I really could have stayed and chatted all night. Very interesting stuff. Sensei Keith Walker also brought along some old UKKW newsletters, most were older than I am! There were some really interesting articles about ‘best practise’, correct warm-ups and possibly the first ever article on Karate fight analysis – exactly the same as what I wrote my Dissertation on, if only I’d known about the article then. 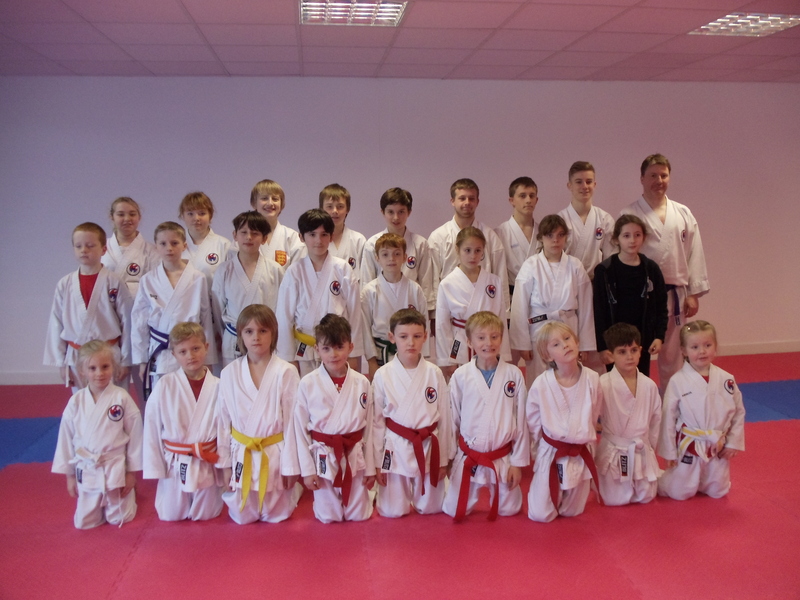 Karate competition is a great way to challenge yourself and to test your training. It can also help keep children motivated in their training and give them something to aim for, helping to teach them valuable life skills such as good sportsmanship and determination, all whilst making new friends and stretching their abilities. This competition is only for our club members and Little Ninjas to take part in. It’s therefore a perfect opportunity to see what Karate competitions are all about. The event is very relaxed and the club instructors (who are also nationally qualified judges/referees) will be explaining the competition rules in detail so that students and parents know what is going on, what judges look for and how you can help your child progress in Karate competition. The younger students will also get to see some of the older ones in action too. The Little Ninjas will have their own Kick Master category, so they won’t be competing against the Karate kids. All entries need to be submitted and paid for in advance of the competition, strictly no entries on the day. Please speak to one of the instructors for more information. The club held it’s annual start of year course on Saturday and once again it was well supported. The event gives students the chance to get rid of those cobwebs from the Christmas and New Year break because it’s a much longer training session than a regular class. This is particularly beneficial since the next club grading is just a few weeks away. We had a full compliment of instructors so students were given a lot of specific feedback on their basics, pairs work and Kata (pre-arranged form). We also had time to work on some wrist manipulations and controls and the advanced students went through some Tanto Dori (Knife defence). Thank you to everyone who supported the club by attending.